Make sure they're well away from fences, garden sheds and houses and are not hiding any hedgehogs! Never light them with flammable liquids such as petrol or paraffin. Ensure fully extinguished before going back indoors. Keep in a sealed box or tin and use them one at a time, replacing the lid immediately. 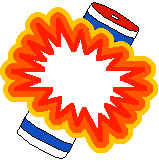 NEVER use a naked flame to light fireworks - light them at arms length using a taper or firework lighter. Stand well back and never return to a firework after it has been lit - it could explode. Ensure children using sparklers are supervised at all times. Do not tough sparklers when they go out - they will still burn you and dispose of them in a bucket of cold water. Keep a bucket of water and a garden hose handy.